VooDoo Innovations announces the launch of their newest AR 15 Rail the Detachable Auto Return Keymod (DARK). The rail promises to be a game changer in the firearm industry. The only AR 15 free floating handguard and rail of its kind. VooDoo Innovations announces their newest, game changing rail. Ultra sturdy and self aligning, this custom rail is going to take the firearm world by storm. Introduced at this year’s SHOT Show in Las Vegas, Nevada, the rail has been creating a lot of hype. The Detachable Auto Return Keymod "DARK" rail received its awesome name through a contest on social media. That’s right, you read correctly, VooDoo's new rail was named by a fan! The contest was launched on Facebook to give the power to the fans and a chance to win the newest version of the rail. As the only AR-15 free floating handguard and rail of its kind, VooDoo “Innovations” has lived up to their name. The DARK rail is super rigid and ultra sturdy and contains many unique features. One key feature on the rail is the quick release system. This system features a locking removal lever that allows fast and easy removal of the handguard from the barrel. This allows you to quickly make any changes to the 9 setting XLP Piston Gas Block that you want before re-installment. Once reinstalled the rail is self aligning, simply locking back into place and returning the rail to the exact position, restoring optics to their original alignment and maintaining MOA accuracy. If that’s not enough, this is all done without the need for any tools. 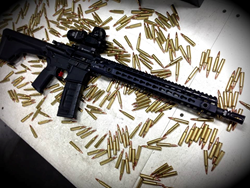 As a manufacturer of parts and accessories for the AR-15 and other platforms, VooDoo Innovations is a leader in providing quality products for modern day shooters. They pride themselves on bringing innovative products to market using the most technologically advanced methods. For more information and VooDoo Innovation's products please visit voodooinnovations.com.